As some of you may have gleaned from my social media presence over the last week, I have become a blonde. My decision to bleach my hair was, I’ll admit, kind of random. But also pretty thoughtful. I’ve seen other people do it and thought it was cool. I just never thought I could “go through with” or “pull off” something like this. But a few weeks ago I said, “Why not?” and I scheduled a consultation with a hair stylist at a local salon. I went to Mousey Brown Salon two weeks ago for my consultation. 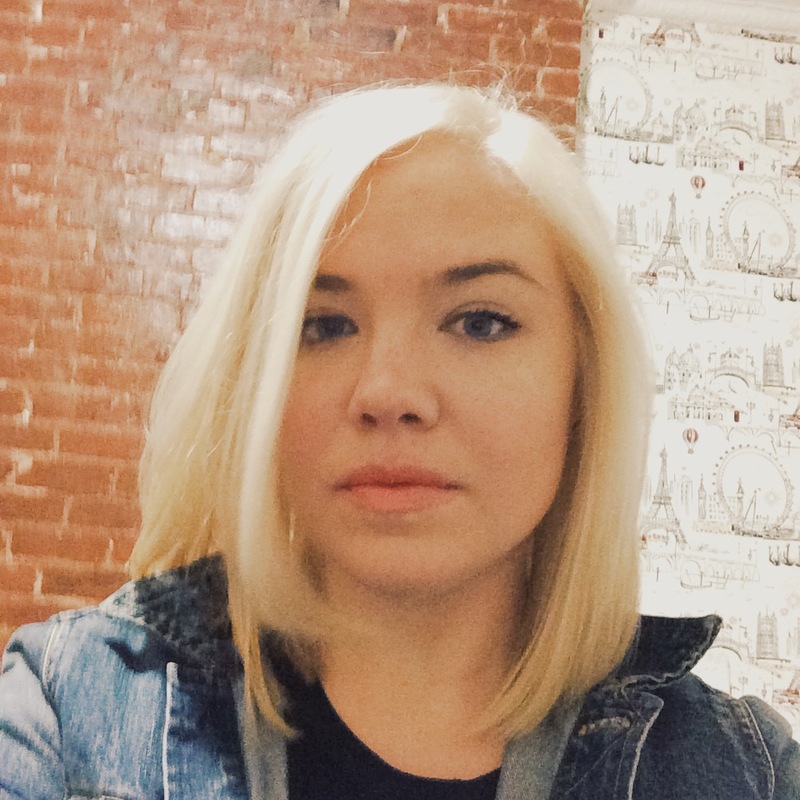 After I told her the color I was going for – peroxide blonde or as blonde as possible – my stylist, Erin, talked me through the rest of the process. She suggested that we chop my hair off at the shoulder to get rid of all of my damaged hair. Then she explained the “double process,” in which my hair would be beached and then toned. When I showed up at the salon last Saturday, I was definitely nervous but determined not to chicken out. Erin was super cool and made me feel very comfortable before we got started so the whole 3.5 hour process actually seemed painless. First, she chopped my hair off to shoulder length, which was a big enough change. Then she started the bleaching process. This took a very long time. She bleached all of my hair, except for my roots, and then after about half an hour applied more bleach to my scalp. I expected this to hurt, but it was actually rather painless because I hadn’t washed my hair in two days and the oil on my scalp protected me. It certainly didn’t feel great; it just wasn’t nearly as bad as I thought it would be. 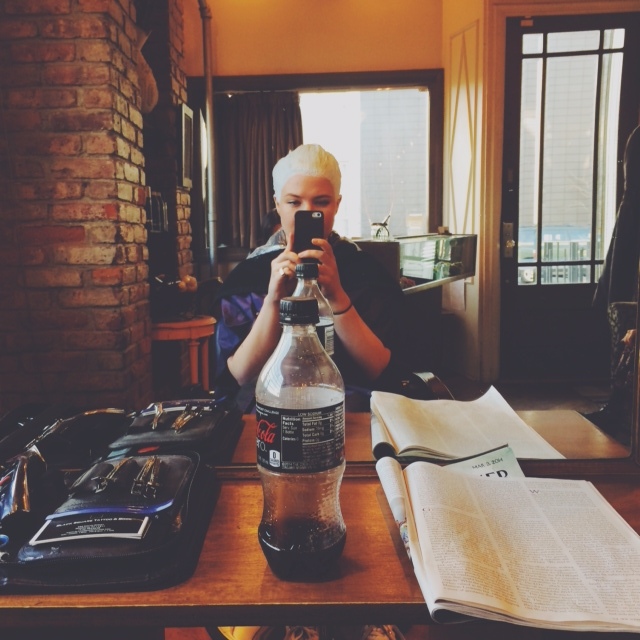 The only photo I took while in the salon, while all of my hair was getting bleached. After this, we began the long process of rinsing my hair out, putting more bleach on it to get ALL of my hair as light as possible, shampooing it, and then doing all of that over and over again until Erin was happy with the results. Then she used toner to get out the brassiness and shampooed and conditioned my hair. Finally, she finished cutting my hair and blew it dry! I have to say, I was pretty excited when I saw my new hair. I didn’t really think I would regret my decision, but I was nervous that I might. I didn’t…at all. And I still like it just as much a week later as I did last Saturday. It has taken me a little bit to recognize myself in the mirror, but that’s becoming less and less of a problem every day. Overall, I feel extremely proud of myself for deciding to make such a big change and then actually going through with it. I am excited to embark on this new era of Blonde Haley, who is bolder, more confident, and able to get drinks really, really quickly at the bar. And in honor of my new hair color, I performed Blondie’s “Hangin On The Telephone” at karaoke that night, which was way more fun as a blonde. Anyway, that’s it. At some point, I will probably (I hope) make a list of all of the notable comments/reactions/comparisons I’ve gotten. I think I should be back on schedule in terms of posting this week. Life has been a little hectic as I’ve been trying to juggle still-ongoing jury duty, new job stuff and social stuff, so please be patient with me while I’m going through this bizarrely extended transitional period. Love it and love you for doing it. You go, Haley. Liberation! Talk to Alison who sees her hair as a canvas to paint on. Joy joy joy! Furthermore, why not? Thanks, Janet! Alison is right. And yes, why not?